A quick note on how to take your DAA medication. Read the package insert and follow the instructions with respect to with (or without) food. Administration with food enhances the oral bioavailability of sofosbuvir, velpatasvir, and voxilaprevir. Relative to fasting conditions, mean sofosbuvir systemic exposure (AUC) increased by 64% to 144%, mean velpatasvir AUC increased by 40% to 166%, and mean voxilaprevir AUC increased by 112% to 435% when the combined sofosbuvir/velpatasvir/voxilaprevir formulation is administered with food. Food enhances the absorption of all the ingredients. You get roughly 2 x as much Sofosbuvir, 2 x as much Velpatasvir and 3 x Voxilaprevir. To put this another way, if you take Vosevii WITHOUT food you will only get something like 1/2 the dose. Note that this advice is equally applicable to Epclusa which is the same (just missing the Vox) and the ignoring this advice may cause your treatment to FAIL. This advice also applies to Viekira and Mavyret which should be taken with food. Sovaldi, Harvoni, Daklinza, and Zepatier can be taken with or without food. In terms of food, think a real meal with some protein, fat and carbohydrate. 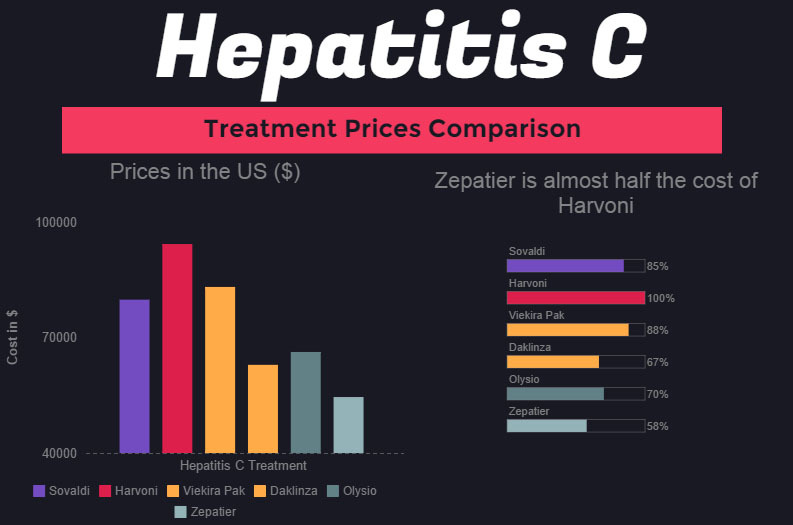 Is Zepatier cost low enough to drive down the Hepatitis C treatment prices? Hepatitis C treatment prices are one of the most discussed issues in the medical world today. The patients want lower prices. The doctors have spoken against the high prices, and even the US Senate had a hearing about it. But the price of Hepatitis C treatment remained the same even almost 3 years after the first modern treatment - Sovaldi by Gilead Sciences - was introduced. In January 2016, Merck joined the Hepatitis C treatment market with the launch of Zepatier, a new and effective Hepatitis C treatment. While the Zepatier's cure rates for genotypes 1 and 4 are very comparable with other existing treatments such as Harvoni and Viekira Pak, Zepatier has one thing going for it - a lower price point for treatment. Will the lower Zepatier cost be enough to bring down the cost of other Hepatitis C treatments? If the voices of patients, doctors and even the US Senate have no effect on how big pharma is pricing Hepatitis C treatments - because this is how capitalism works - will the introduction of Zepatier decrease these prices by presenting major competition? According to general capitalistic economics, the added competition will have a net effect on lowering the prices across the board. But this is pharmaceutical industry with its specifics - can we still count on economic laws to work here? Let us take a look at the Hepatitis C treatment prices. As we see from the graph, the first treatment Sovaldi's price point is $80,000, followed by Harvoni's $94,500 price point - to date, Harvoni cost of standard treatment is the highest. When AbbVie introduced Viekira Pak at $83,319 per treatment, the price of Harvoni didn't decrease - primarily because Harvoni has an advantage over Viekira Pak due to simpler regimen. Daklinza, introduced by BMS, also didn't manage to decrease the prices of other Hepatitis C treatments. However, the introduction of Zepatier with the lowest price point for modern Hepatitis C treatment at $54,600 might at least do something to decrease the costs. As we see, Zepatier cost is more than 40% lower than that of Harvoni, while the medications can arguably considered as very similar in effect. What has been done thus far to decrease Hepatitis C treatment costs? Gilead Sciences, producer of Sovaldi and Harvoni, and the main player in Hepatitis C treatment market has thus far take two measures to react to the overwhelming pressure from all sides as far as the treatment cost reduction is concerned. A good news is that majority of Hepatitis C patients can qualify for the Harvoni co-pay program. The price is reduced but it is still more than $70,000 per treatment. Generic Sovaldi and Harvoni are sold for less than $2,000 in India but one has to travel there to get them - this is where FixHepC Buyers Club steps in and helps patients to get it in a convienent way without the need to travel to India and bargain with the doctors and sellers there. How can Zepatier lower cost effect Hepatitis C treatment prices in the near future? After Harvoni, Viekira Pak and Daklinza, two very successful Hepatitis C treatments were launched with a notably lower price point. However, Gilead remained unyielding and did nothing about the existing price of Sovaldi and Harvoni, despite the introduction of competition. This may be because Sovaldi and Harvoni have a strategical advantage over the new competition - Viekira Pak has a complex regimen (a patient has to take multiple pills per day) and Daklinza usually involves the use of sofosbuvir (an active ingredient in both Harvoni and Sovaldi), making both of them a tad bit inferior competitors. Zepatier is the one we have been waiting for that can change the game. Not only does Zepatier offer a high cure rate for naive patients, the clinical research has revealed that in some patients who were already being unsuccessfully treated with interferon, Zepatier might have better clinical results than both Sovaldi and Harvoni - making Zepatier a contender to be reckoned with. On top of this, Zepatier price of treatment is $54,600 in the US. In a normal economy, when you have two very comparable goods such as Harvoni and Zepatier, with one being much cheaper than the other, people will opt to go for the cheaper version. In this case, the only way for Harvoni to still be competitive, is to reduce it price and make it more comparable with the price of Zepatier. Nonetheless, this is the pharmaceutical industry where things are not as simple as they might seem. Harvoni, being already launched for about two years, has build up a reputation as a safe and effective Hepatitis C cure. Zepatier is a new-comes - less known but cheaper. Only time will tell how this plays out but it is a hope of most of Hepatitis C community that the lower cost of Zepatier will help decrease the cost of Sovaldi, Harvoni, Viekira Pak and Daklinza due to the increased competition. Today I have some good news for Hepatitis C patients with genotype 1 or genotype 4. In the beginning of February 2016, pharmaceutical giant Merck has entered Hepatitis C treatment market by introducing a completely new drug. Under its trademark, it is known as Zepatier. What is more, Zepatier consists of a completely new set of drug molecules - elbasvir and grazoprevir - and is thus different in the mechanism of action from sofosbuvir-based as drugs by Gilead Sciences, Sovaldi and Harvoni. The major difference between this treatment and all the other Hepatitis C treatment that were recently approved by the FDA is the price of Zepatier. Zepatier costs only $54,600 per treatment in the US which compared with Harvoni's price tag of $94,500 is quite a reduction. However, albeit Zepatier is cheaper and will add competition that will hopefully drive down the prices, the costs of being treated for Hepatitis C are and will in the near future remain enormous. This is exactly why we at FixHepC.com are bypassing the system established and paid for by pharmaceutical industry to provide you with affordable Hepatitis C treatments and make it available for everybody in need of them. Pretty much anybody having Hepatitis C is aware that there are 6 genotypes of Hepatitis C. If you are wondering what sofosbuvir-based treatment is best for you, you can read about genotype specific treatments here. Not all medications treat all genotypes - for example Harvoni, being arguably one of the best medicines out there, is not used (it is not even registered) to treat Hepatitis C genotype 2. Zepatier has a more narrow therapeutic potential. It can only be used to treat Hepatitis C patients with genotype 1 or 4. Majority of Hepatitis C patients (54%) are suffering from genotype 1 while only 1% of all patients has genotype 4. This means, roughly speaking, that the new Zepatier drug launched by Merck and approved by FDA is intended to be used in about 55% of all Hepatitis C patients. Before we go into details about Zepatier cure rate (which is comparable with other existing Hepatitis C treatments), let us have a look under the hood of this Merck medicine. APIs or Active Pharmaceutical Ingredients are the ones that make any drug achieve its therapeutic effect. In the case of Harvoni, for example, we have sofosbuvir and ledipasvir as active ingredients, and we already know that for modern Hepatitis C treatment we always use two or more active substances in order to be sure HPV was completely eliminated. Elbasvir and grazoprevir are active substances that make Zepatier work. Both of them were originally developed by Merck and designed specifically to treat Hepatitis C. These two molecules represent years of work that Merck's drug discovery department has put in to launch Zepatier. Let us look at elbasvir and grazoprevir more closely. The first molecule, elbasvir, has been found to inhibit Hepatitis C virus replication by blocking one of the vital proteins (NS5a) that is essential to the replication process. Elbasvir mechanism of action renders NS5a inactive and thus prevents HPV from making more and more viruses. When the replication is stopped, human immune system does the heavy work by targeting and eliminating the remaining virus. A great thing about elbasvir is that is is very potent and very selective. Potency means that it inhibits NS5a very effectively even at smaller dosages. This is why Zepatier contains only 50 mg of elbasvir. Selectivity is also crucial - elbasvir inhibits NS5a and only NS5a - this means that it does not alter other important processes. Both of these qualities are very important when it comes to Zepatier side effects. Namely, Zepatier side effects are mild because the high cure rate can be achieved with small dosages of a very selective elbasvir molecule. Grazoprevir is a second active substance in Zepatier. Instead of targeting NS5a like elbasvir, grazoprevir mechanism of action is directed at inhibiting Hepatitis C virus proteases. With the function that these proteases perform, the HCV is unable to replicate further and is eliminated over the period of several months by body's immune system. Grazoprevir mode of action is always used as kind of a side-kick of the primary active substance (elbasvir in the case of Zepatier). A good property of grazoprevir is that is useful as a treatment for more resistant HCV genotypes. According to clinical studies done by Merck, Zepatier cure rate is very high. For patients with Hepatitis C genotype 1, it was found that Zepatier cures 94-97% of patients. On the other hand, for genotype 4, the numbers are even higher - 97-100% cure rate. You can read everything about how the studies were set up at Merck' Zepatier press release. Some patients are advised to use ribavirin together with Zepatier in order to achieve the best treatment results. Side effects are mild for a life-saving treatment. 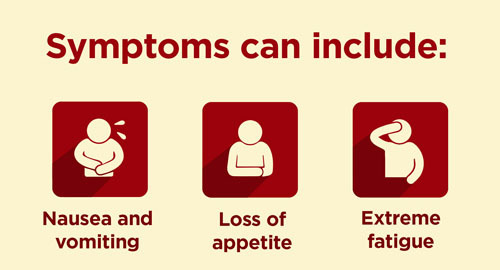 These include side effects that are mostly common with other Hepatitis C drugs such as Harvoni and Sovaldi. The Zepatier treatment last for 12 or 16 weeks, depending on the genotype and patient's state, and despite the side effects being mild, they can be very bothersome. Having a feeling of nausea for 3 months is not something that one can tolerate with ease. The cost of Zepatier is a major think that distinguishes it from other Hepatitis C drugs. Because Merck prices Zepatier at $54,600 per treatment, the drug has already been called a game changer in Hepatitis C treatment. Harvoni, for example, another Hepatitis C treatment, costs $94,500 per treatment in the US. The much needed competition is here. Zepatier cost might force other big players such as Gilead Sciences and Abbvie to lower the prices of their Hepatitis C medications. However, if you are in need of Hepatitis C drugs, we at FixHepC.com can provide them for less than $2,000. Contact us with your problems and wishes and we will try our best to help every Hepatitis C patient in need.